Oddland is a progressive metal bamd from Finland, founded in 2001 and they released their full length debut album called The Treachery Of Senses in 2012. Four years later, Oddland signed a deal with Sensory Records and their new album is called Origin. The brand new album contains 9 songs and the music of Oddland is a blend of prog metal influences from bands as Primus, Tool, Devin Townsend, Meshuggah and even grunge bands like Soundgarden or Alice In Chains. The opening track Esotericism is filled with heavy distorted guitar riffs and raw vocals and here singer Sukari Ojanen reminds me of the lead singer of Candlemass. Follow up Thanatos features a jazzy-like intro and here I define obvious Primus influences. Penumbra is another great track, featuring an excellent vocal performance by Ojanen and an extremely catchy guitar riff played by Poikonen. Hidden kicks off with a soft piano intro before it evolves into a rather mysterious prog metal "monster". Fortunately singer Ojanen only sings and the grunts are almost completely disappeared; only in the song Faraway he still grunts a little; sad but true... My favourite track is called Unknown and I really think that Oddland has improved a lot since their debut album. 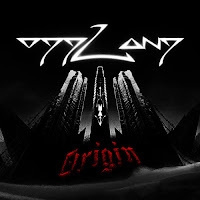 The sound of Origin is low and heavy, but there is also a lot of melody and great variety, but most of all I would call the sound Of Oddland on this album aggressive and really powerful. So, if you enjoy your prog metal really heavy and you like the bands I mentioned earlier in this review, then you should really check out this new album by Oddland. Play it loud, guys!! !